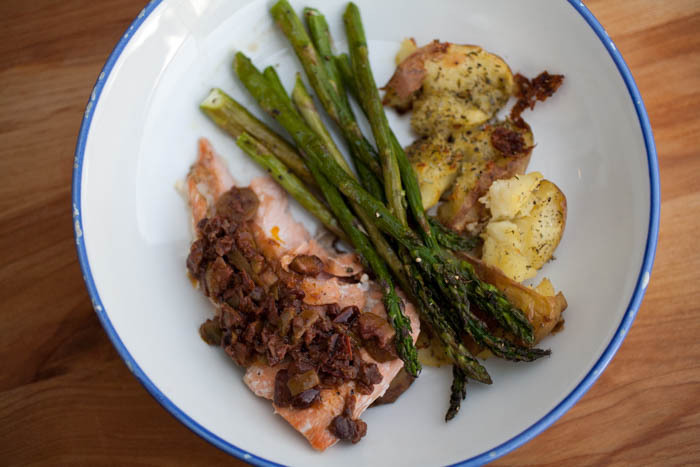 Our favorite way to have asparagus, however, is roasted. It’s quick, super simple and tastes, so, so good. Really! It’s only four easy steps. 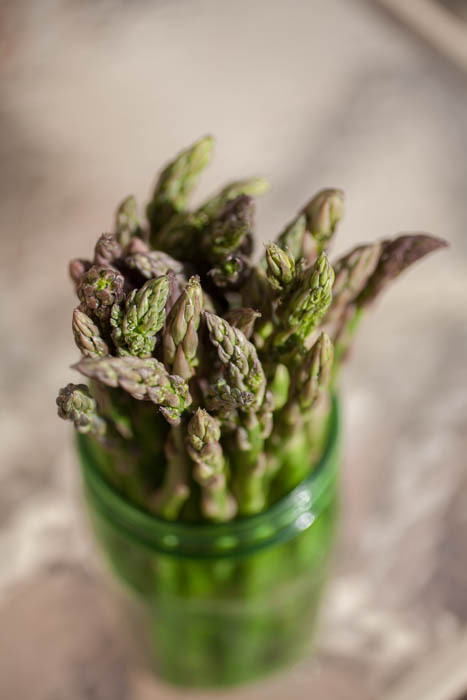 I covered it briefly last week, but here’s what to look for when you buy asparagus: early spring asparagus (March and April) will be tall, thin stalks. Asparagus from later in the season will be thick, fat stalks. 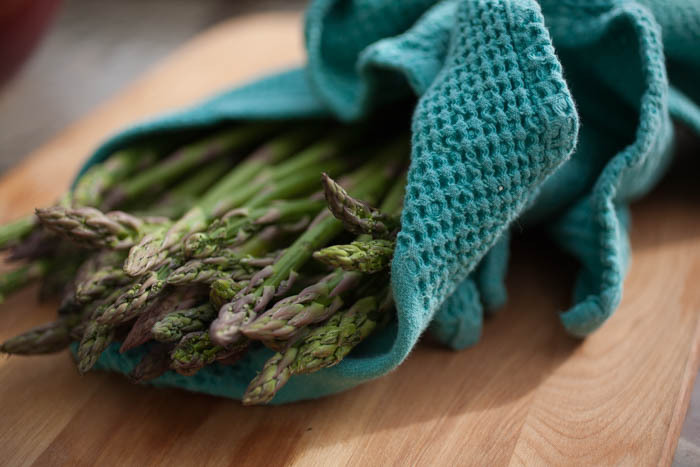 There’s not too much difference between the two, although asparagus from early in the season will be sweeter and more tender while asparagus from later in the season will be a little tougher and taste a little woodier. It’s all still delicious though. 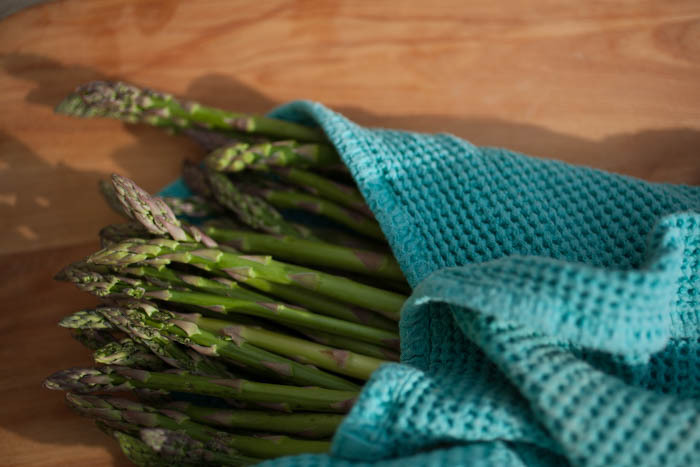 Look for asparagus that is a deep, vibrant green—don’t buy anything that’s more brown than green, or dull. The heads of the spears should be tight and the spears themselves should stand up straight on their own. Limp and wrinkly spears are old, chewy and don’t taste very good. Once you get the asparagus home, take the rubber bands off. Fill a big glass cup or jar half full with water and stick the spears in with the stems down. Keep the jar in the refrigerator. This will help the asparagus last if you’re not going to use them right away. However, asparagus does taste best if you it them within a few days of buying them. Preparing the asparagus is easy. Rinse the stalks and pat them dry with a towel. Now you’re going to trim the asparagus to take off the tough, woody end of the stalks. You can either do this with a knife—cut ¼ of the way up the stalk—or you can just snap the end off. 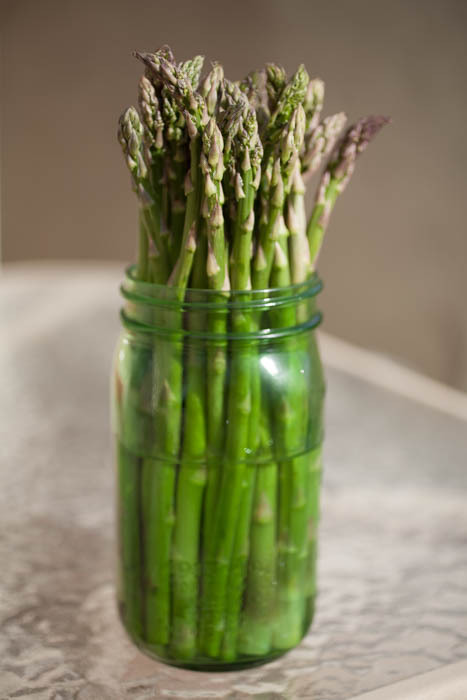 I feel snapping is the best way to trim the asparagus because the stalk usually breaks where the rough part ends. This way, you don’t have to worry about any tough parts being left behind as sometimes happens when you cut it with a knife. Plus, there’s just something satisfying about the crisp “snap” of an asparagus spear. I’m weird, I know. Seasoning the asparagus is usually as simple as olive oil, salt, and pepper (and not too much for that matter). 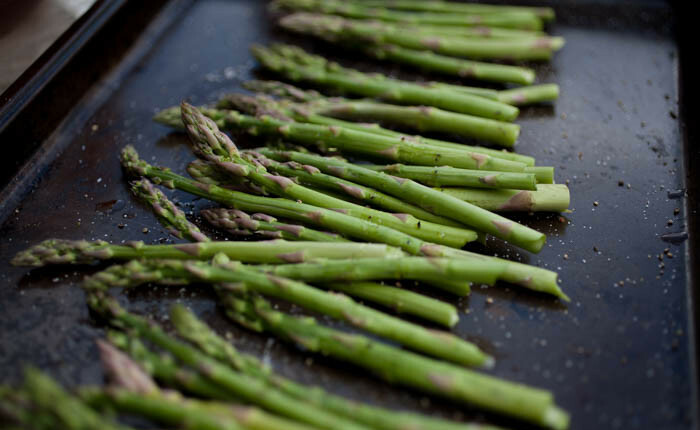 Basically, you put the trimmed asparagus on a lined baking sheet, drizzle olive oil over the spears, sprinkle with salt and pepper, then toss them around the baking sheet to make sure the spears are decently covered. The amount of olive oil, salt, and pepper you use is dependent on your taste. 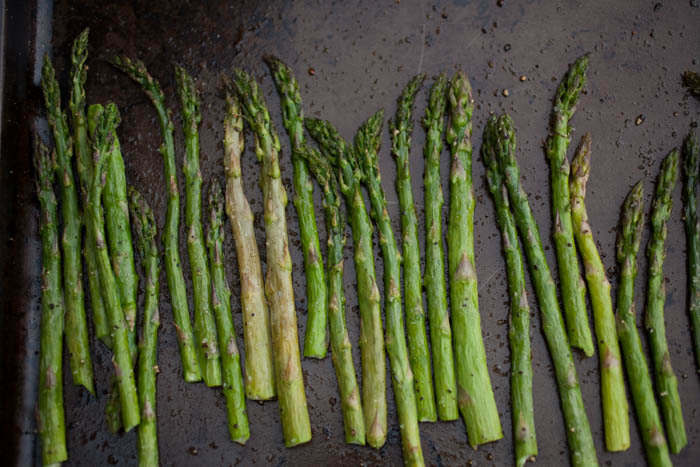 I use enough olive oil to just coat the asparagus, then more pepper and less salt. You may want more salt and less pepper, or more olive oil. You can even sprinkle a finishing salt like Maldon or Fleur de Sel if you want to add a bit more salt after the asparagus has been roasted. Finally, roasting. The time and temperature I give here are perfect in my home oven—yours may differ. 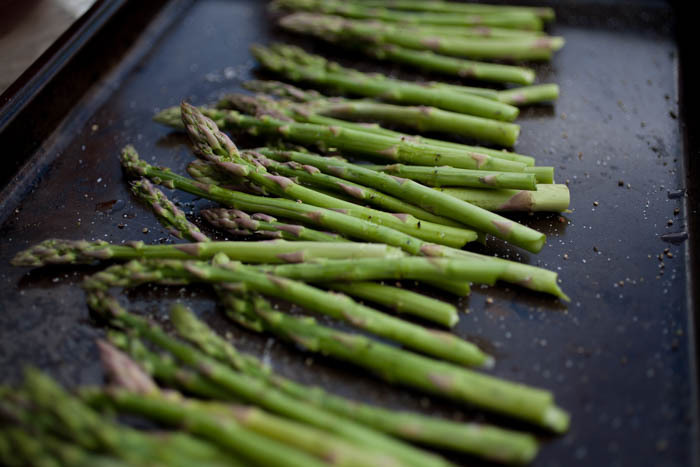 Because every oven is different, you’ll need to watch the asparagus carefully the first few times you roast it to measure the perfect timing and temperature. Use the measurements I give here as a jumping-off point and play with it yourself: a 400° oven for about 10 to 15 minutes (the size of the spears make a difference, too). What may also be different is the end result you want. 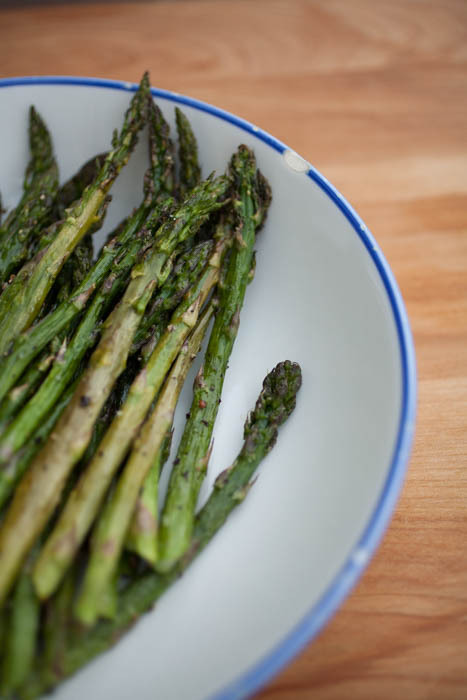 In our house, we like the asparagus to be crisp at the end, but still vegetable-crunchy. Some like their asparagus almost raw, others nearly burnt. In the end, it’s up to you, so you’ll have to measure the time it’s in the oven. Previous Post: « All About: Spring Produce!